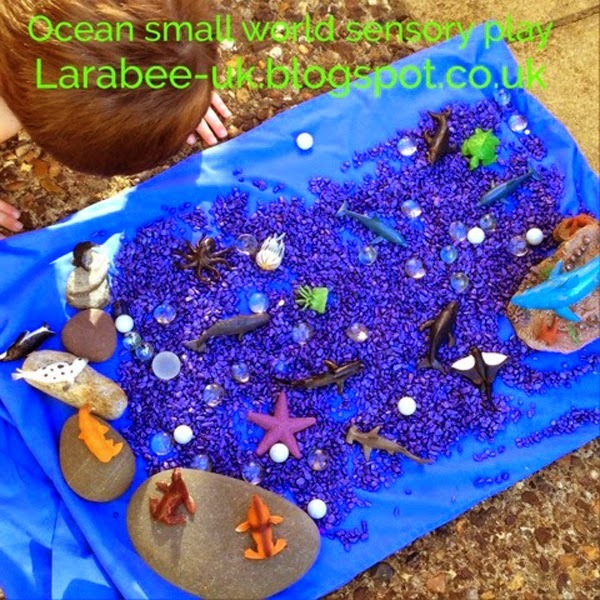 We're continuing our theme of ocean and sea life based activities. 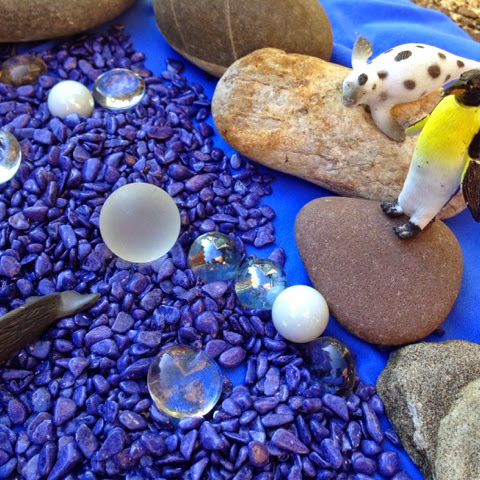 A friend of ours had some fish tank pebbles and a shark bridge she was throwing away so we claimed them and made a little small world tray. 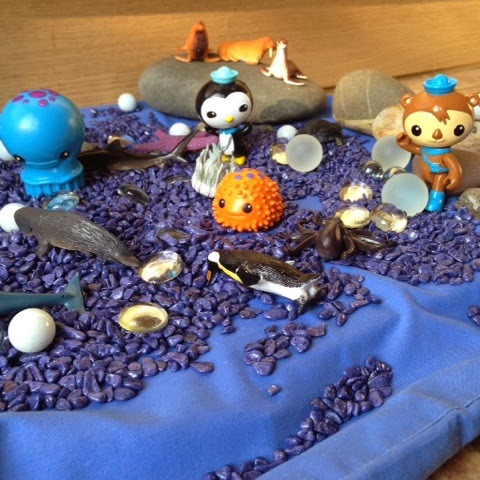 We then added our ocean animals. 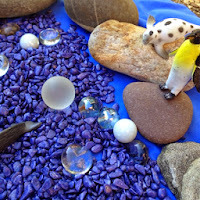 I started off by just giving T the chance to play how he wanted but he soon started to ask questions and so it turned more into a joint learning play activity which wasn't really the original objective but still lead to lots of discussion and some fun! 1. 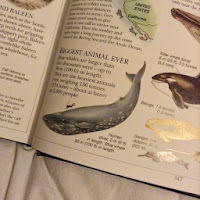 We talked about which animals lived on land and which lived in the water, T liked this and we didn't really have any problem with this one. 3. 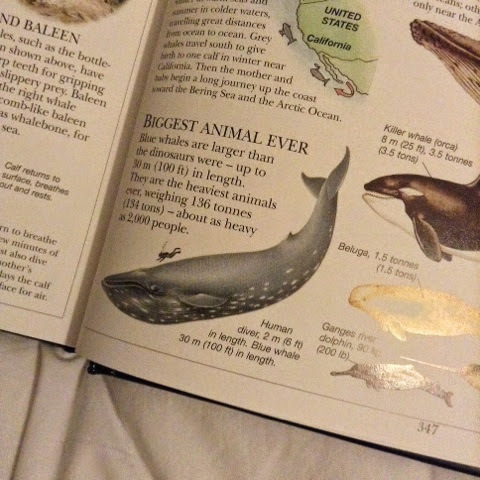 We went on to talk about the size of the animals, I showed him a page from one of our books which demonstrates how big the blue whale is compared to a human but he just picked up the blue whale and the starfish and said 'wow Mummy this sea star must be a giant', I then tried to explain that here we call it a starfish not a sea star (yeah - thanks Octonauts, although sea star does make more sense!) and that our ocean figures were not to scale 'what's not to scale Mummy?' you see my dilemma! So I'm now on the look out for some nice big figures, if you know where sells them at a reasonable price please do let me know, otherwise I'll be hotfooting it down to Toys R Us. So there you are, not quite as planned but the tray is still out and I'm hoping that T will go back to it and play with it in a more imaginative way. Perhaps my idea to introduce a little natural history into our play is a step too far at the moment and I should just let him play as he wishes. 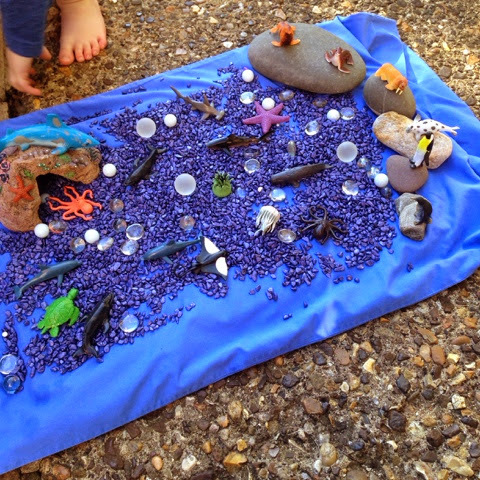 We have a pinterest board dedicated to all things 'ocean themed' for small children, have a look for some ideas, or better still follow us, all of this months ocean blog posts will be added throughout the month. 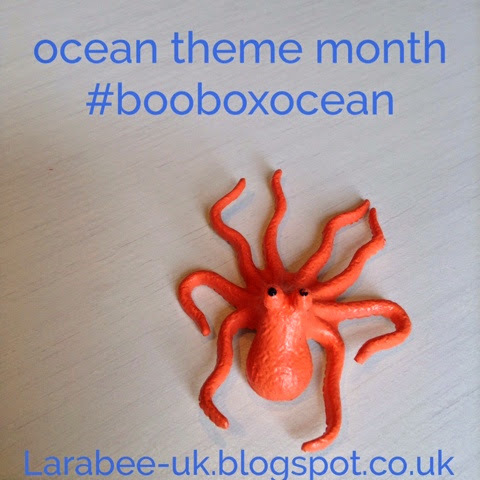 We will be tagging all of our activities with #booboxocean if you'd like to follow or join in over on Instagram or twitter. 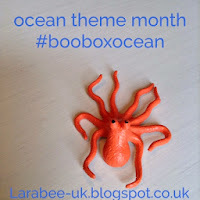 All of our ocean themed blog posts can be found here if you'd like to catch-up. 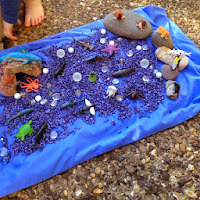 If you have an ocean themed post you'd like us to link to or you'd like to write a guest post, please leave a comment, there's always space for more! Love this... I've been having some tuff spot envy and would really love one too! 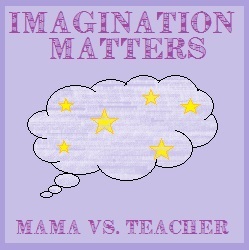 Thanks for linking up to #imaginationmatters, it would be great if you could link up next week for the "summer" theme too.